It’s true, you know. All good things must come to an end. I know because my Boston life, which is good, is coming to an end. If you’ve been reading this nook of the internets since the beginning, you may know that, this summer, I’m packing up all my worldly possessions (including my Kitchen Aid stand mixer, my autographed Chase Utley bobblehead doll and a healthy dose of nervous excitement) to start classes at The French Culinary Institute in New York City. A week from Friday marks the big day (of moving, that is. Culinary classes don’t start until June. Let’s not rush things. I have a feeling it’s going to take me just as long to master the art of living in New York City as it will to master the art of french cooking. We’ll see.) At any rate, with just over a week left to call myself a Boston resident, I can’t help but feel a thick veil of finality settling in around me. This past weekend I sang my last song and took my last bow and said my goodbyes to the wonderful cast of Gypsy. I’m glad to have my weekends back, but I already miss the cast comraderie and the nervous pride of putting on a show. Today is my last day of work, and while I’m thrilled to finally rid myself of cubicles and expense reports and overused consulting phrases (don’t even get me started on “low-hanging fruit”), I’m going to miss the office banter with Dan and long lunches (including LOST recaps and people watching) with Maral. Oh, and the steady paycheck. That I’m definitely going to miss. I’ve cleaned out my desk and bought boxes for packing and cancelled my gym membership, and as my daily routine crumbles, everything is really starting to feel over. For now, I can only focus on the endings, but I know that soon I’ll be surrounded by beginnings, fresh and scary and fun. There will be a new apartment to paint and new friends to make, a new city to learn and new knives to sharpen, and for all of that I cannot wait. Still, goodbyes are always bittersweet, and I think this one, especially, calls for brownies. These brownies are sort of a signature of mine; I make them whenever I need an easy yet impressive dessert (or else just a straight shot of gooey chocolate), and though brownies may seem like a pedestrian, ho-hum sort of choice, these never fail to impress (or to trigger a magnificent chocolate-induced coma). Laced with two forms of coffee and a dash of Bailey’s Irish Cream, these brownies are a grownup version of your favorite afterschool treat. They’re moist, dense and sinfully chocolatey, and if you decide to make them for someone (an office full of your colleagues on your last day of work, say), they won’t soon forget you. Preheat oven to 350 degrees F. Butter a 9x13x2 inch metal baking dish and line the bottom with parchment paper. Butter the parchment, too. Heat the butter in a medium pot over low heat until melted. 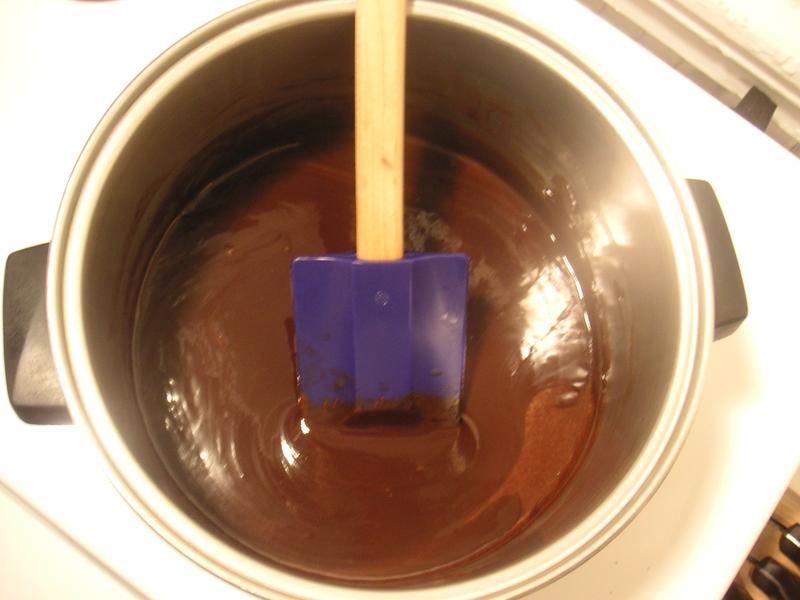 Add the chocolate and stir until melted, removing from the heat. Stir in the brewed coffee. In a small bowl, mix together the flour and salt. In a medium bowl, mix the eggs and sugars with the ground coffee, vanilla and Bailey’s until combined. Once the butter/chocolate mixture has cooled a bit, add the egg/sugar mixture and stir to combine. Add the flour mixture, stirring until just blended. Lightly coat the chocolate chips with flour and fold into the batter. Pour batter into prepared pan. Bake for 35-40 minutes, or until the top cracks slightly and a skewer inserted into the center comes out with moist pieces clinging to it. 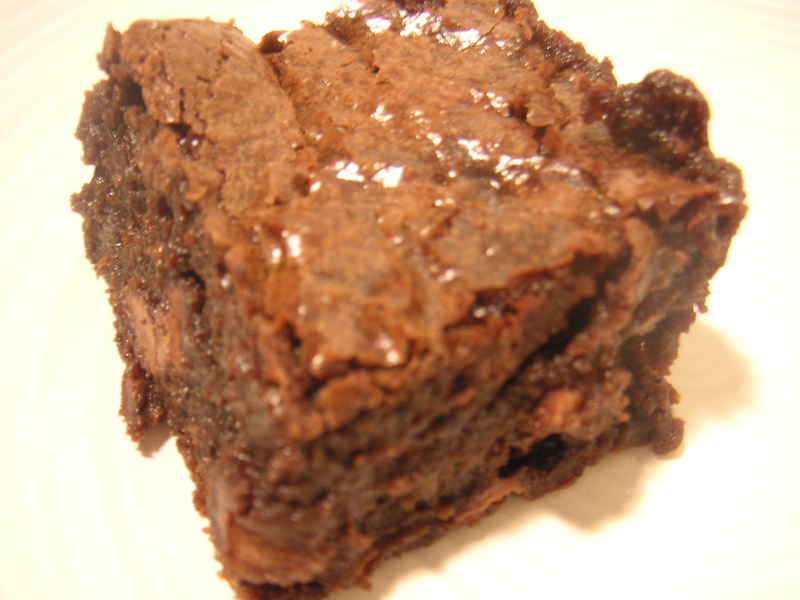 Do not overcook the brownies (remember that they will continue to cook slightly after being removed from the oven). funny, heartwarming, delicious…your best post yet. yes indeed, bittersweet, and your best one yet……. Are these the FAMOUS Molly Gilbert brownies that I had the pleasure of purchasing through jobpic!?!?!?!?! ?